Although this is an absolutely pointless blog post, I do want to share with you guys the 5 movies that I could watch a million times (not consecutively) and never get tired of them. About 10 years ago I would have said Babe and Lord of the Rings (the first one) because I fell asleep to them every night. I don't watch either of them anymore... also, I'm not going to bother with accuracy in regards to name spellings or anything, cause I don't care right now. So, in no particular order, here are the 5 movies and a little bit about why I think they are so awesome! I am not always a fan of Will Ferrell, but he happens to be in two of these movies. I think my favorite thing he has done other than these was when he did Alex Trebek in Celebrity Jeopardy skits on SNL. 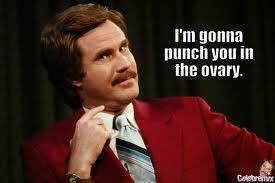 The completely random and off the wall things that are said in Anchorman are just so stupid they are hilarious. I am pretty dang stoked about Anchorman 2. I think Paul Rudd is dreamy and the whole cast of the first one was fantastic. Remember when Brick killed a guy? Although this is probably my last choice out of the 5, it's a doozy for mostly two reasons: Melissa McCarthy and the cute guy with the accent. Again, McCarthy's off the wall, what in the world comments just make me giggle. Did you know the guy she wanted on the plane is her husband in real life? True story. Oh man, where to I begin? Are you thinking what I'm thinking? Aim for the bushes... this movie is so ridiculous it's ridiculous... and I love it. Mark Wahlberg should only be allowed to do comedies. It's one of those great thinks like with Robert DeNiro, Christopher Walken, Bruce Willis, Al Pacino... you are so used to them in serious roles that when they are in comedies it just blows your mind. Michael Keaton's silliness was a gem too... and then the classic lines... you shot Derek Jeeter... he's a biracial angel! Good times. I know, this one shocked me too! I think I was bored one day and this was on, so I watched it. I haven't found an Adam Sandler movie funny since I was 14, so this came out of left field that I thought it was so funny. And the great thing about it is that my daughter loves watching it with me too. I vow that one day I will have pets that I can name Poopsy and Pagogo. 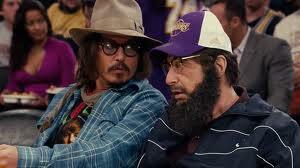 I am using this photo because Johnny Depp has a great cameo where he is at a Lakers game with Al Pacino. He's wearing a ridiculous Justin Bieber tee shirt and Jill asks him if he's from Duran Duran and he says yes. I love me some Johnny Depp... but this movie was funny for many other reasons. I think the first time I saw this I was really disappointed... but then the next 20 times I loved it! For some reason, seeing Cameron Diaz play a money hungry deadbeat slacker is quite fun. And her attitude about some things reminds me of myself. I could never be quite so vicious, but still... and the chick who plays Amy Squirrel is great, Jason Siegel is great, Justin Timberlake is great, the dowdy teacher who wants to be cool is great and the guy who plays the principal that I always confuse with Fred Willard is great. The cast just makes the whole thing work out perfectly and the plot was actually pretty good as well. Seems you really like comedies. Bad Teacher was pretty funny. That's an interesting fact I didn't know about the Bridesmaid fact you pointed out. I'm not a fan of Will Ferrell. Horror is actually my favorite genre, but usually once you see it, it's not fun to watch again because you know the ending.